A "Glasgow Connectivity Commission" was announced last week and it has prompted me to write this post. 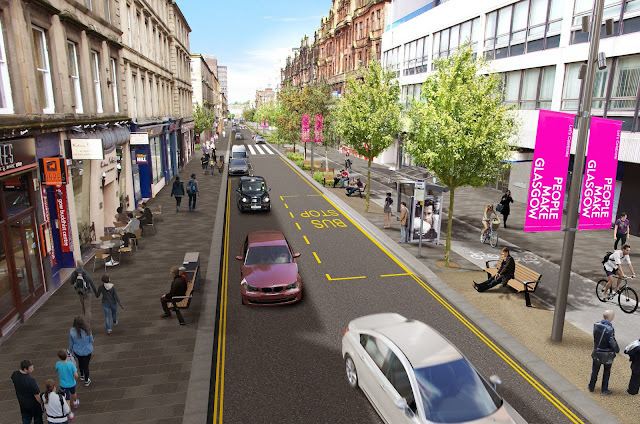 I am picking as an example the current proposed works on Sauchiehall St although any of the current planned schemes could be used. ( Partick Bus Station(in work) ,Woodlands, Victoria Road , Battlefield , "Connected Clydebank" , Edinburgh Picardy Place etc ). It shares a similarity with most of these other schemes as it has one major change that overwhelms all street users. A lot of these points have been presented over the consultation process but were thought not important enough or responses back took so long as to be after the planning was approved. This is mainly tfo make sure they are noted in a public way for future reference. I do not drive , i walk and use the bus and subway. Restricting vehicle travel on this and other roads in the city is essential. Most journeys through the city centre are by habit of historically learned routes that could be done more efficiently by bypassing using the motorway or other external streets. Recent changes have taken a step back in city transport , changes to the bus stops on Union street have not been constructive and reduce the ability to do connected journeys and show how little our transport planners use the city transport system. The statement of a SPT manager at a recent travel seminar was how he had not used his car that morning to attendend as if it was a shock and had used a train and can use public transport "where appropriate" unlike all the people who have to use it. This post is a look at this scheme from the view of a pedestrian , this could be young,old,sensory impaired, with children, shopping, out for entertainment. A view not often sought or heard against all the different vehicle ( car/bus/bike/taxi ) lobbies and proponents. Pedestrians who probably also use public transport. There are no specific pedestrian groups represented although a few claim to do , my practical knowledge of them always shows that to be a minor side issue used to gain funding for other schemes. Not Sustrans ,Living Streets or GDA , i know and have had to interact with all of them in other schemes. A lot of consultations have neglected to take into account the pedestrians travelling through an area and the fact that they are the only people who can go into shops and businesses without additional parking spots or street furniture for securing vehicles. There is also little thought for the ongoing maintenance costs for the variety of surfaces. 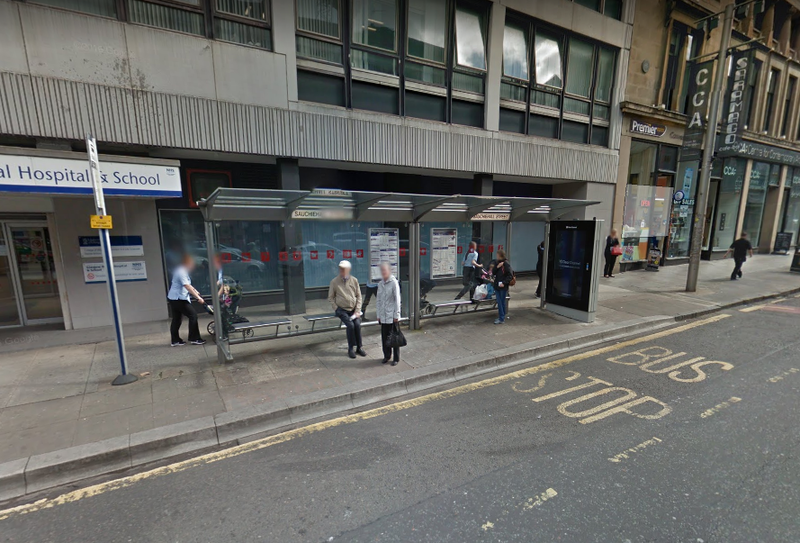 Glasgow has major trip hazard problems due to stone edges lifting and lack of surface fixes. A majority of these issues could have been avoided by better inclusive planning. "Vision Zero" starts with the pedestrian . Dont promote other forms of transport by denigrating pedestrians. The cycle path on the south side of the street would have been a better solution but work to change drains has been given as an excuse. 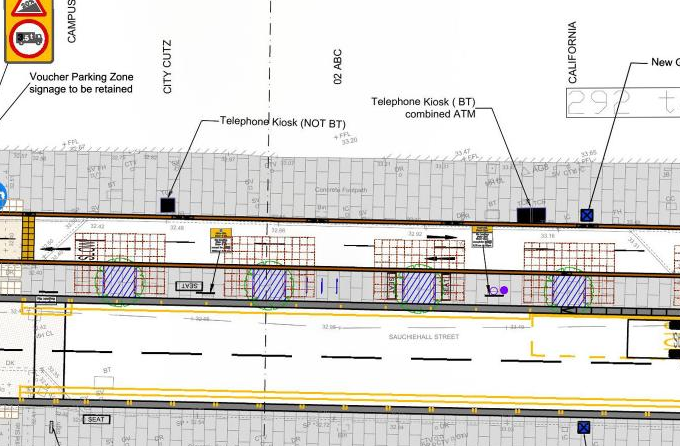 "17/00240/DC | Public Realm works including improvements include the introduction of natural stone footways, removal of pay and display parking on Sauchiehall Street, introduction of a 2-way cycle lane, planting of trees and associated root zones. In addition measures will be introduced to improve pedestrian and cyclist movements at junctions. 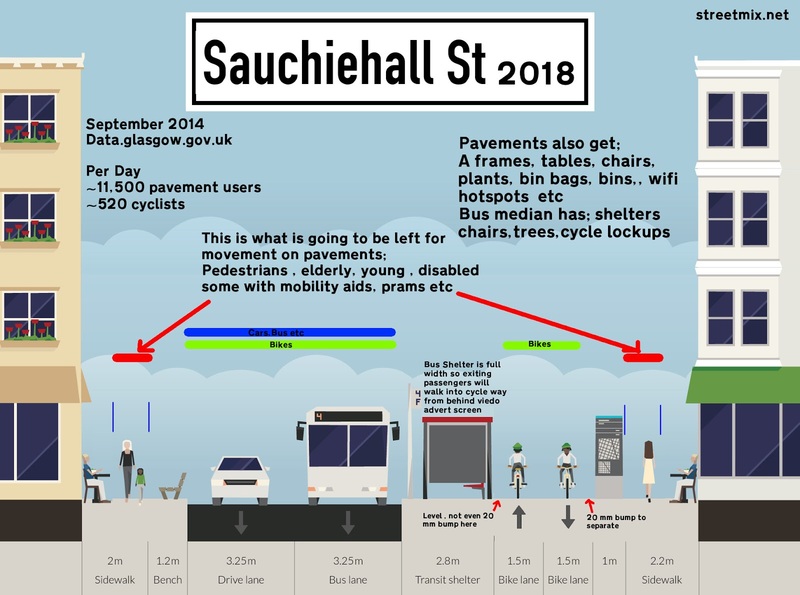 | Site At Sauchiehall Street Between Charing Cross And Rose Street/ Blythswood Street Glasgow "
Major physical change is the cycle path so lets have a look at that. Here is one of many Government pages about it LINK . Reading it you would think it was mainly one form of transport due to the number of related documents with walking as a minor afterthought. Here are openly available numbers for this street. Pedestrians were 95.5% of journeys and Cycling was 4.5%, but the term "Active Travel", or "Total Journeys", is used to display the larger number,involving pedestrians, to justify changes. You will see in a lot of documentation that changes are expressed as percentage changes not absolute numbers as a 100% increase appears dramatic but it can be a tiny portion of actual journeys. It says nothing of the potential reduction in other journeys caused by the inclusion of changes. Making an area less safe for pedestrians will lead to a reduction. NB The true priorities are kind of shown by the upcoming consultation for Battlefield being handled at a page on the council web page called cycling. Lets not pretend these are anything for pedestrians. Not even the pretence of "Active Travel". There is no https://www.glasgow.gov.uk/walking or https://www.glasgow.gov.uk/activetravel . Click on to get a bigger version. The new cycle path can be seen from St Georges Road to just before Rose St. Recognition of danger by having posts on one side but no protection for crossing. 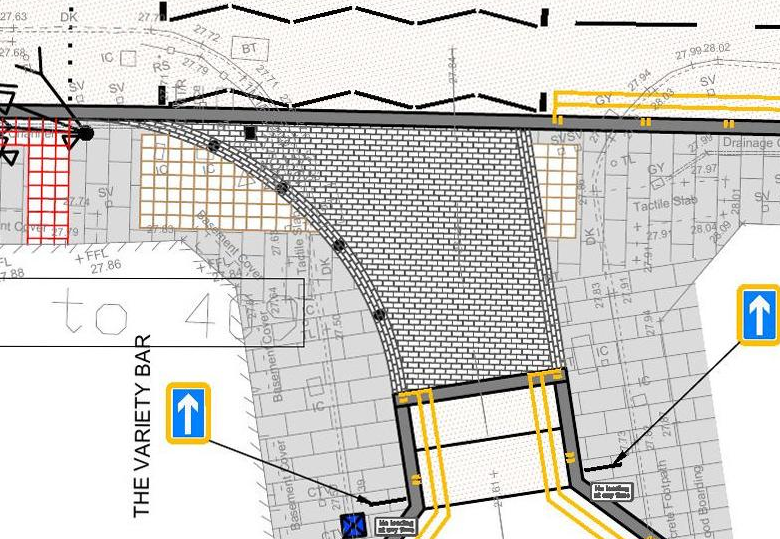 The restriction in width from the current pavements can be seen on the main street as well. With cycle path on south side we would have ended with one badly restrictive side of the road but current plan makes both sides less useful. 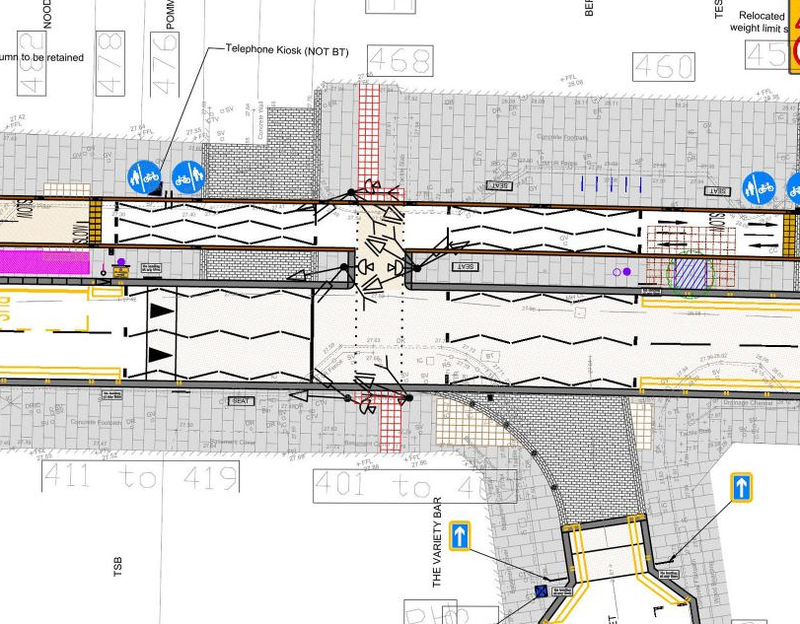 This is not even lip service to the stated goal to "improve pedestrian movements at junctions"
Passengers getting off/on bus are stepping directly onto both ways cycle path. Unless the cyclists are held to walking speed this is going to cause injuries. Are there going to be speed restrictions along this path. 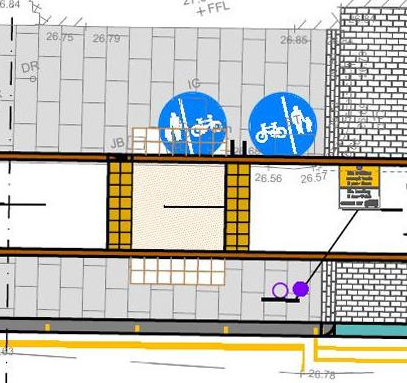 How about more space available for prams and shopping trolleys ? You need to use the busses to know about these . The bus stops in the plans do have advertising blocks at the ends so do restrict the view along the paths when exiting. Cross paths marking/indication/stonework intended to create separation of bikes and pedestrians. 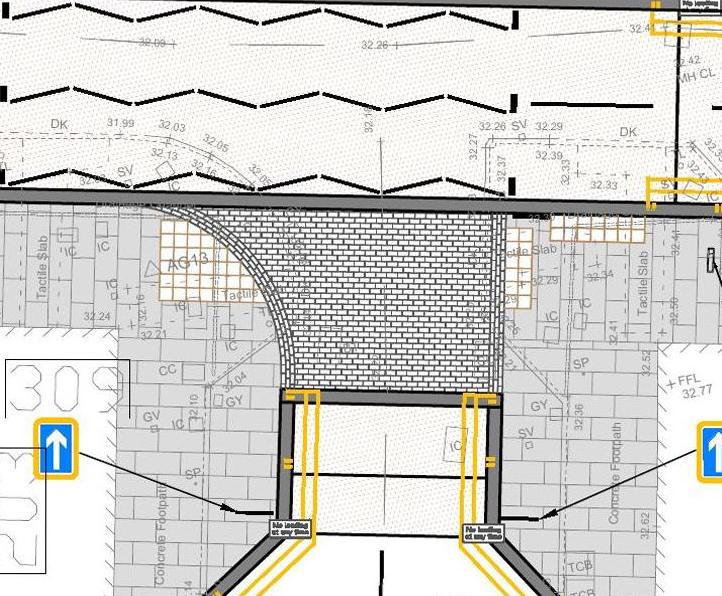 The proposed kerbs do not provide enough differentiation to prevent any coming together of the pavement users. Mix of bikes/pedestrians in wet/icy/snowy weather. What gets gritted first and will bikes ride along clear paths created by the majority pedestrians. 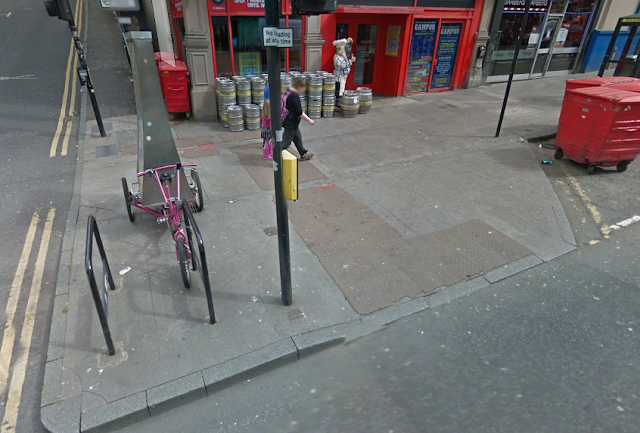 How do you get from cycle path( especially westbound ) to Elmbank st where the crossing signal has been removed and there is no red light restricting bike across pedestrians. Will bikes just skip over the island bit to get there. Area outside ABC. People waiting,entering or exiting have to avoid cycle path ? Need to cross cycle path to wait on the "island" between the road and the cycle path. Is the Nite Zone still there ? 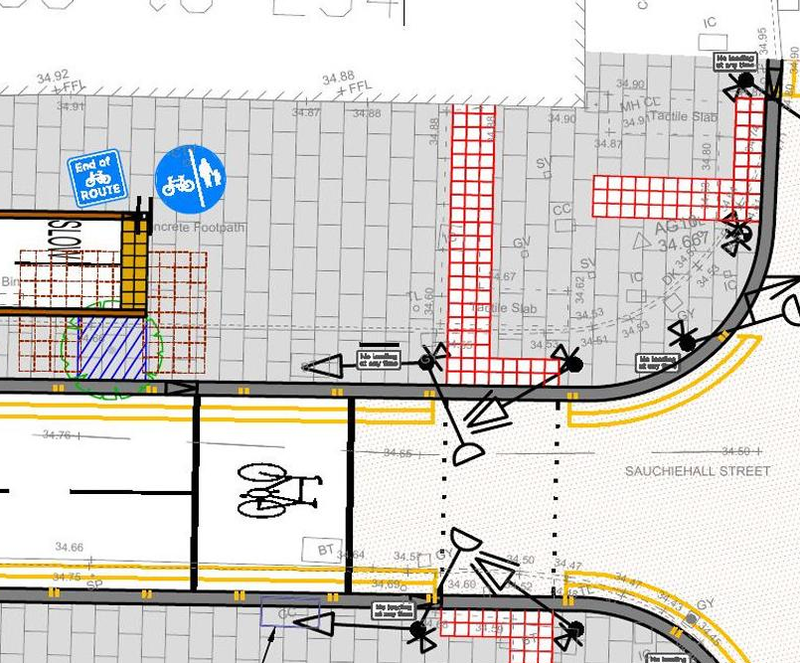 Add in the additional street furniture needed to support the paths and how it already restricts the pavements, you can understand how pedestrians think they are very low on the priority list. Seats on the island between cycle path and right next to busses/cars is pandering to give the appearance of concern without practical thought. Streetscape: Canopy gone from outside Mclellan Galleries? We cannot have an inclusive accessible city without actively seeking out a range of voices and opinions. Some groups are very vocal and their opinions catered for outwith the impacts on other groups. This goes to all methods of collecting,compiling and presenting plans being accessible as well.If the presentation of the Commissions start cannot be done in an accessible and inclusive manner i doubt they will do anything about it during their work. Equality Impact assessments need to be treated with proper respect and not with a cursory paragraph rehashed from other plans. (Update Dec 19th. 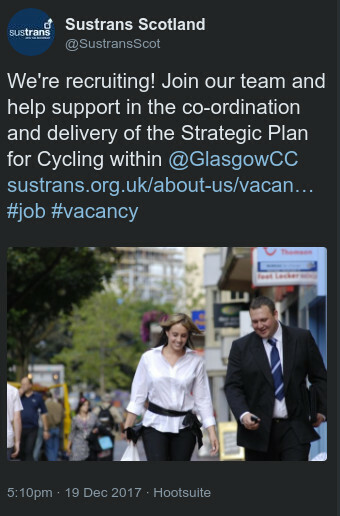 Sustrans have way too much control over local government choices. They are control too much funding affecting infrastructure and focus too tightly on cycling with "Active Travel" as the buzz phrase that shields them. The farcical competitions they run are contrary to any fair ( legal? someone should really investigate and apply the rule regarding gaming ) system , pushing a mind set without actual competition. 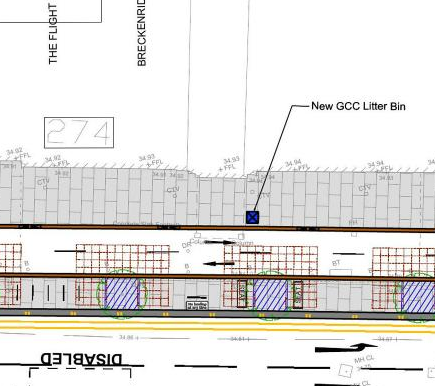 Try to find the Strategic Plan for Pedestrians/Walkers for GCC. This is a scam allowed to continue that endangers pedestrians. Of course the picture with the posting is of people walking. 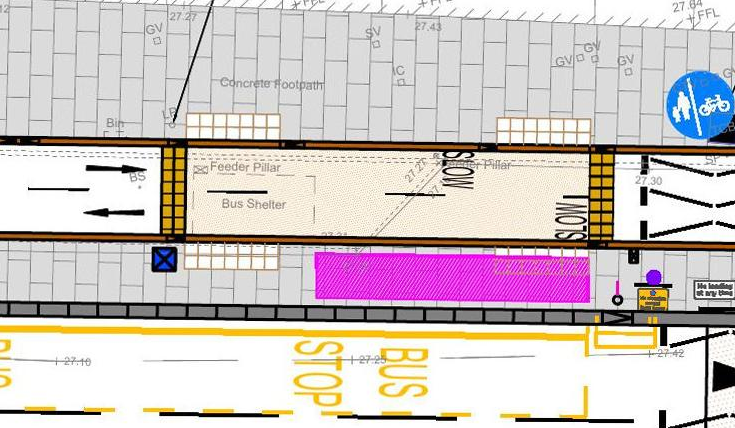 Obscured view for bus passengers using shelter and walking into cycle path.